Once Again! What Does Nonprofit Board Oversight Mean? Every week, three or four nonprofit case stories surface in the meida related to inadequate oversight by nonprofit boards of directors. Many of the cases result six or seven figure dollar losses to the nonprofits. Following is my personal list of what reasonable board oversight means to attempt to help nonprofit boards of directors to avoid such losses. At least half the board should be able to analyze the monthly or quarterly financial statements. Have voluntary information sessions available for those who do not have the skills. Make certain the board has developed or is developing a current strategic plan. Make certain that the organization has a knowledgeable CFO. No board member should have to worry about the safety of the organization’s assets. Be especially alert when financial reports are frequently late or one or more directors perceive financial personnel are inadequately skilled. [i] For guidance in this process see: Eugene Fram & Bruce Oliver, (2010)“Want to Avoid Fraud? 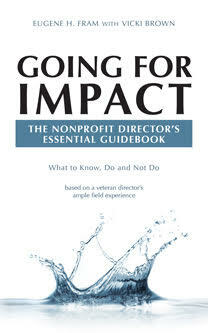 Look to Your Board,” Nonprofit World, pp.18-19. ← Can a 9-Year Tenure Promote Nonprofit Director Effectiveness? I agree with all your points, thanks for putting them down so clearly. I would add it is necessary to have a straightforward financial process with tiers for cheques and signatures required for those tiers. It cannot be that one person is able to sign all cheques. I agree that all internal account must be handled in accordance with strict accounting standards.